VANCOUVER, Oct. 21, 2015 /CNW/ - NovaCopper Inc. (TSX, NYSE-MKT: NCQ) ("NovaCopper" or "the Company") is pleased to announce drill results from its 2015 summer field program at the Arctic poly-metallic volcanogenic massive sulphide (VMS) deposit, which is part of the Upper Kobuk Mineral Projects (UKMP) located in the Ambler mining district of Northwest Alaska. All amounts are in US dollars unless otherwise indicated. NovaCopper completed fourteen diamond drill holes for a total of 3,056 meters of core. The 2015 in-fill drill program was designed to evaluate vertical and lateral continuity of the high grade polymetallic copper, gold, silver, lead and zinc mineralization, and support upgrading of inferred resources to measured and indicated resource classification within the area of the proposed Arctic open-pit as outlined in the Company's National Instrument 43-101 – Standards of Disclosure compliant technical report entitled "Preliminary Economic Assessment Report on the Arctic Project, Ambler Mining District, Northwest Alaska" dated effective September 12, 2013 (the "2013 PEA") (see press release dated September 12, 2013). Two of the fourteen holes (AR15-0139 and AR15-0145), representing 631 meters drilled, were specifically targeting geotechnical information for preliminary pit slope design work in the area of the highwall of the proposed open pit (see Drill Hole Location Map - Figure 1). The Company is pleased to announce that all fourteen holes encountered significant mineralized intervals of high grade mineralization which are reported in Table 1. These drill results, along with on-going engineering studies described below, will be used in support of a pre-feasibility study on the Arctic deposit (see press release dated July 10, 2015). Results are consistent with previous drilling conducted within the resource area on the property. AI = Continuous Assayed Interval (meters). Copper equivalent (CuEq) calculations use metal prices assumptions of $2.90/lb for copper, $1,300/oz for gold, $22.70/oz for silver, $0.90/lb for lead and $0.85/lb for zinc. Copper equivalent calculations reflect gross metal content and have not been adjusted for metallurgical recoveries. Results are core intervals and not true thickness; true widths have not been determined for the above intercepts but are believed to be representative of actual drill thicknesses. Significant interval defined as a minimum of 1.0 meter Cu interval with average grade >0.7% Cu. Cutoff grade of 1.0% Cu. Internal dilution up to five meters of <1.0% Cu. Intervals of <1.0 meter not reported. Some rounding errors may occur. "We are pleased to have completed another successful drill campaign, one that saw Zero Loss Time Incidents (LTI's), no environmental incidents, 56% local NANA shareholder hire and some really fantastic drill results that further demonstrate that the Arctic deposit is one of the highest grade, open pitable copper deposits known in the world," stated Rick Van Nieuwenhuyse, President and Chief Executive Officer for NovaCopper. "In addition to the exceptional copper grades, the zinc and precious metals credits will provide the Company additional flexibility as we advance this project up the value chain. Overall, it was an excellent field season and we look forward to improving our geological understanding of the high-grade polymetallic Arctic deposit and incorporating this year's data into our models and future pre-feasibility level work." NovaCopper contracted SRK Consulting of Vancouver, Canada (SRK) to conduct a dedicated field investigation comprised of drilling, mapping, laboratory test work and downhole installations. A summary report detailing a gap analysis, desktop study findings and field investigation recommendations was issued prior to the drill program. Two dual purpose drill holes were completed for geotechnical (soil and rock) and hydrogeological data acquisition. Additionally, SRK hydrogeologists re-visited previously installed vibrating wire piezometers to ensure data loggers were operational and to download pore pressure measurement data. A civil geotechnical site visit was conducted to investigate surface conditions and provide comment on potential infrastructure and waste management facilities layout. Furthermore, structural mapping of exposed rock faces along the Arctic ridge, along with downhole televiewer and structural logging of newly acquired drill core were consolidated with prior work to support a 3D structural model. Moving forward, SRK will use the 2015 field investigations to support rock geotechnical assessment, hydrogeological assessment and pit slope design which is intended to be used to support a future pre-feasibility study. Under the guidance of SRK, NovaCopper initiated acid-base-accounting kinetic test work at Arctic; both on-site barrel testing and parallel laboratory humidity cells. In addition, NovaCopper plans to collect samples from this year's drill program to increase static testing coverage over the Arctic deposit. Environmental baseline data collection continued, including 34,000 acres of wetlands delineation within the project, which was completed by WHPacific of Anchorage, Alaska. Seventy percent of a LiDAR survey over the UKMP was completed by WHPacific and Quantum Spatial before weather conditions became unfavorable; NovaCopper plans to complete the remaining thirty percent of the LiDAR survey in 2016. The mineral resource estimate which forms the basis of the 2013 PEA considers diamond drill holes drilled by different operators during the period 1965 to 2011. The mineral resource for the Arctic Project is supported by 43 core holes (approximately 13,500 m) drilled by NovaCopper and its former parent company NOVAGOLD Resources Inc. ("NOVAGOLD") and 92 core holes (approximately 17,600 m) drilled by previous owners Kennecott, and/or a Kennecott subsidiary. The 2013 PEA was based on Indicated mineral resources totaling 23.8 million tonnes grading 3.26% copper, 0.71g/t gold, 53.2 g/t silver, 0.76% lead and 4.45% zinc, and Inferred resources totaling 3.4 million tonnes grading 3.22% copper, 0.59 g/t gold, 41.5 g/t silver, 0.58% lead and 3.84% zinc. The 2013 PEA is preliminary in nature, includes inferred mineral resources that are considered too speculative geologically to have economic considerations applied to them that would enable them to be characterized as mineral reserves, and there is no certainty that the preliminary economic assessment will be realized. The 2013 PEA was prepared by Tetra Tech of Vancouver, Canada and the full technical report is available on SEDAR, EDGAR and on the Company's website. The 2013 PEA describes the potential technical and economic viability of establishing a conventional open-pit copper-zinc-lead-silver-gold mine-and-mill complex for the Project. The 2013 PEA, evaluated on a 100% basis, yielded a Net Present Value ("NPV8%") of $928 million and $537.2 million on a pre-tax and post-tax basis, respectively using base case metal price assumptions of $2.90/lb for copper, $1,300/oz for gold, $22.70/oz for silver, $0.90/lb for lead and $0.85/lb for zinc. Mineral resources that are not mineral reserves do not have demonstrated economic viability. The drill program, sampling protocol and data verification were managed and overseen by qualified persons employed by NovaCopper. Twelve in-fill diamond drill holes were drilled at NQ diameter drill core and two geotechnical drill holes were drilled at HQ diameter drill core by Boart Longyear of South Jordan, Utah. Samples in mineralized core were collected using a 0.3-meter minimum length, 2.0-meter maximum length and 0.9-meter average sample length. Samples in un-mineralized core were collected using 2.0-meter minimum length, 10-meter maximum length and 4-meter average sample length. Drill core recovery averaged 94% without overburden. Three quality control samples (one blank, one standard and one duplicate) were inserted into each batch of 20 samples. The drill core was either sawn or shipped as whole core, with samples sent to ALS Minerals, Fairbanks, Alaska for sample preparation and the sample pulps forwarded to ALS's North Vancouver facility for analysis. ALS Minerals in North Vancouver, B.C., Canada, is a facility certified as ISO 9001:2008 and accredited to ISO / IEC 17025:2005 from the Standards Council of Canada. Erin Workman, P.Geo, Director of Technical Services and an employee of NovaCopper, is a Qualified Person as defined by National Instrument 43-101. Ms. Workman has reviewed the scientific and technical information in this news release and approves the disclosure contained herein. Ms. Workman has reviewed the results of the drill program and confirmed that all procedures, protocols and methodologies used in the drill program conform to industry standards. NovaCopper Inc. is a base metals exploration company focused on exploring and developing the Ambler mining district located in northwestern Alaska. It is one of the richest and most-prospective known copper-dominant districts located in one of the safest geopolitical jurisdictions in the world. It hosts world-class polymetallic VMS deposits that contain copper, zinc, lead, gold and silver, and carbonate replacement deposits which have been found to host high grade copper mineralization. Exploration efforts have been focused on two deposits in the Ambler district - the Arctic VMS deposit and the Bornite carbonate replacement deposit. Both deposits are located within NovaCopper's land package that spans approximately 143,000 hectares. 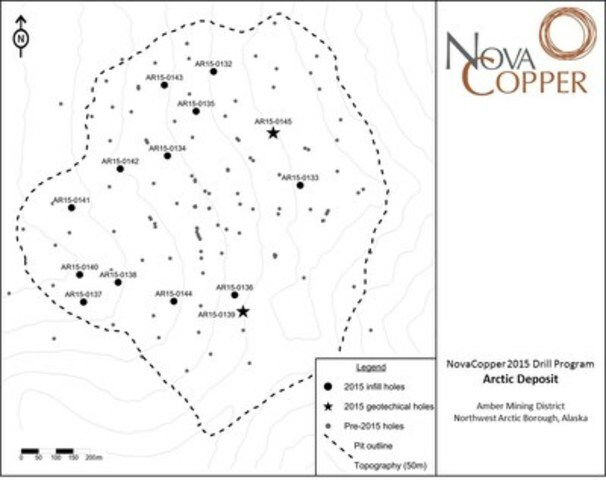 NovaCopper has an agreement with NANA Regional Corporation, Inc., a Regional Alaska Native Corporation that provides a framework for the exploration and potential development of the Ambler mining district in cooperation with local communities. Our vision is to develop the Ambler mining district into a premier North American copper producer. The Company also owns 100% of the Titiribi Project located approximately 70 kilometers southwest of the city of Medellin, Colombia, in Antioquia department, within the historical Titiribi mining district. This press release includes certain "forward-looking information" and "forward-looking statements" (collectively "forward-looking statements") within the meaning of applicable Canadian and United States securities legislation including the United States Private Securities Litigation Reform Act of 1995. All statements, other than statements of historical fact, included herein, without limitation, statements relating to the anticipated activity at the UKMP Projects, the anticipated preparation of a pre-feasibility study and the potential re-categorization of mineral resources are forward-looking statements. Forward-looking statements are frequently, but not always, identified by words such as "expects", "anticipates", "believes", "intends", "estimates", "potential", "possible", and similar expressions, or statements that events, conditions, or results "will", "may", "could", or "should" occur or be achieved. Forward-looking statements involve various risks and uncertainties. There can be no assurance that such statements will prove to be accurate, and actual results and future events could differ materially from those anticipated in such statements. Important factors that could cause actual results to differ materially from NovaCopper's expectations include the uncertainties involving the need for additional financing to explore and develop properties and availability of financing in the debt and capital markets; uncertainties involved in the interpretation of drilling results and geological tests and the estimation of reserves and resources; the need for cooperation of government agencies and native groups in the development and operation of properties and infrastructure; the need to obtain permits and governmental approvals; risks of construction and mining projects such as accidents, equipment breakdowns, bad weather, non-compliance with environmental and permit requirements, unanticipated variation in geological structures, metal grades or recovery rates; unexpected cost increases, which could include significant increases in estimated capital and operating costs; fluctuations in metal prices and currency exchange rates; and other risks and uncertainties disclosed in NovaCopper's Annual Report on Form 10-K for the year ended November 30, 2014 filed with Canadian securities regulatory authorities and with the United States Securities and Exchange Commission and in other NovaCopper reports and documents filed with applicable securities regulatory authorities from time to time. NovaCopper's forward-looking statements reflect the beliefs, opinions and projections on the date the statements are made. NovaCopper assumes no obligation to update the forward-looking statements or beliefs, opinions, projections, or other factors, should they change, except as required by law. This press release has been prepared in accordance with the requirements of the securities laws in effect in Canada, which differ from the requirements of U.S. securities laws. Unless otherwise indicated, all resource and reserve estimates included in this press release have been prepared in accordance with National Instrument 43-101 Standards of Disclosure for Mineral Projects ("NI 43-101") and the Canadian Institute of Mining, Metallurgy, and Petroleum Definition Standards on Mineral Resources and Mineral Reserves. NI 43-101 is a rule developed by the Canadian Securities Administrators which establishes standards for all public disclosure an issuer makes of scientific and technical information concerning mineral projects. Canadian standards, including NI 43-101, differ significantly from the requirements of the United States Securities and Exchange Commission ("SEC"), and resource and reserve information contained herein may not be comparable to similar information disclosed by U.S. companies. In particular, and without limiting the generality of the foregoing, the term "resource" does not equate to the term "reserves". Under U.S. standards, mineralization may not be classified as a "reserve" unless the determination has been made that the mineralization could be economically and legally produced or extracted at the time the reserve determination is made. The SEC's disclosure standards normally do not permit the inclusion of information concerning "measured mineral resources", "indicated mineral resources" or "inferred mineral resources" or other descriptions of the amount of mineralization in mineral deposits that do not constitute "reserves" by U.S. standards in documents filed with the SEC. Investors are cautioned not to assume that any part or all of mineral deposits in these categories will ever be converted into reserves. U.S. investors should also understand that "inferred mineral resources" have a great amount of uncertainty as to their existence and great uncertainty as to their economic and legal feasibility. It cannot be assumed that all or any part of an "inferred mineral resource" will ever be upgraded to a higher category. Under Canadian rules, estimated "inferred mineral resources" may not form the basis of feasibility or pre-feasibility studies except in rare cases. Investors are cautioned not to assume that all or any part of an "inferred mineral resource" exists or is economically or legally mineable. Disclosure of "contained ounces" in a resource is permitted disclosure under Canadian regulations; however, the SEC normally only permits issuers to report mineralization that does not constitute "reserves" by SEC standards as in-place tonnage and grade without reference to unit measures. The requirements of NI 43-101 for identification of "reserves" are also not the same as those of the SEC, and reserves reported by the Company in compliance with NI 43-101 may not qualify as "reserves" under SEC standards. Accordingly, information concerning mineral deposits set forth herein may not be comparable with information made public by companies that report in accordance with U.S. standards.